Some places are trendy, cutting edge, or vaguely avant garde. Other places are well-worn classics. In the shadows of the Huntington Building resides a place befitting the latter description. Danny's Deli is one of the many sandwich options designed to nourish the working class in and around Downtown Columbus. The place is always humming during business hours, which is a testament to the quality and speed with which Danny's cooks up breakfast and lunch. 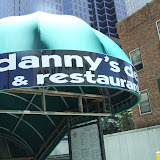 Danny's in Columbus is the second location. The original Danny's, namesake of owner Danny Georges, is in Cleveland. The menu is essentially classic breakfast items and sandwiches with chips, fries, onion rings and other deep fried side dishes. They are in no way affiliated with the equally delicious Danny's Subs in Westerville. Although the menu is laden with Dagwood-esque creations piled with layer upon layer of corned beef, there are a few options available for the meatless-eats crowd. There are a grilled cheese sandwich, a garden burger and a number of breakfast items for those who eat ovum. I tried the veggie wrap. It is essentially a well-dressed salad in a flour wrap. Lettuce, tomato, red onion, black olive, cucumber, mozzarella and cheddar cheese are crammed into a wrap after taking a bath in Italian dressing. The sandwich is a healthy item. I completely undid all of the health benefits by ordering it with onion rings. Prices at Danny's are reasonable. It's difficult to spend more than $10. just got back from danny's deli, on a count of your post. awesome burgers! great fries! and my bf is so full for the NY sandwich. he really loved the corned beef! they're super fast too! we were in and out in 40 minutes (course we ordered the second the server came by because we had been drooling over the menu all morning). thanks for the suggestion! I'm a tree-hugging hippie, so I'm not much for burgers and corned beef. But all the other foodie publications LOVE these sandwiches, so I figured it might be a safe recommendation. Glad you enjoyed it!